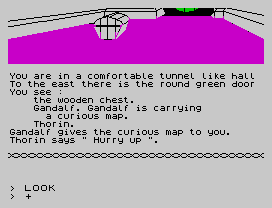 The Hobbit is a text adventure, with some graphics, but quite limited ones; the computer it was originally written on, the Spectrum, had existed only for months, and, besides, Melbourne House (the software house) would never be known for good graphics. The only decent image in the game is the loading screen. But, at the time, they were impressive, simply because they were there — most text adventures, even ones on “bigger” computers, were really text-only. Also, the parser was quite advanced for the time: while other games only supported 2-word commands in the form “verb noun” (e.g. “get sword” or “kill troll“), The Hobbit understood commands such as “take the short sword then viciously attack the troll with it“. You could also give instructions to NPCs, and they even had “personalities” of their own: they would move around independently of you, get into fights (and possibly even die off-screen), pick up and drop objects, and so on. They also could like you more or less, depending on both who they were, and your actions. That made the game much more unpredictable than most “standard” adventures, which could have solutions printed in magazines – not in The Hobbit, as one never knew what would really happen – “solutions” could, at most, tell you how to solve some specific puzzles. The classic phrase "Thorin sits down and starts singing about gold." Yes, it comes from this game. And now, for the personal part. You see, that game was one of the half-dozen or so my father got with the family’s new ZX Spectrum, in 1983, and the only one of them that wasn’t a simple action game. Now, as a 9-year-old Portuguese kid, I knew virtually no English at the time. Not enough to read a book in English, not enough even to read a kids’ book, and certainly not enough to play a text adventure game in English. I am not exaggerating when I tell you I couldn’t even leave the starting location (Bilbo’s house). Nor did I have the slightest idea of who Tolkien was, what Middle Earth was… I had never read a fantasy book in my life. It was a long time ago, but I think I recall that the most “advanced” books I had read at the time were Enid Blyton’s The Famous Five, in their Portuguese translation. So, naturally, I put the game away – “boring text stuff”, I thought. And I played the other ones to death. But, soon, I got bored with them (and it would be a long time before my father got any more games)… yet I was still fascinated with the Spectrum, and that “strange text game” continued to intrigue me. So, I tried to find something more about it. I found some translated instructions, which at least told me how I was supposed to play the game – but that didn’t teach me English, of course. I read newspaper reviews (it wouldn’t be until 3 years later that I bought my first Speccy magazine, the 3rd issue of “Your Sinclair”), which said great things about the game, and, from them, I discovered some small things. Namely, that it was based upon a book, also called “The Hobbit“. Next year, I got English for the first time at school, and I began to learn. And I always came back to the game, and a couple other text adventure games I later got. I also became more and more curious about fantasy, Middle Earth, and Tolkien. related to the above, it made me discover that there are some fascinating things out there that most people don’t know about, because of preconceptions, prejudices and intellectual laziness – but which, with a little bit of initial effort and thought, can be wonderful experiences. Why do you think I love heavy metal music, for instance? it made me discover the exhilarating feeling of solving a problem, or a puzzle, by thinking – a discovery which, incidentally, would be quite useful to me, decades later, as a sysadmin. I could shorten most of the above in this way: I’m a geek mainly because of that game, 28 years ago. It was the turning point in my life; maybe if it wasn’t for it, I would have ended up being “normal”, “average” — listening only to “top 40” music, being obsessed with soccer (watching, not playing, of course 🙂 ), TV, cars and dumb women… and not caring about fantasy, reading, learning, or even simply thinking. As i was reading this article, i traveled to my youth, and despite the spectrum game that is referred here wasn’t one i knew, almost everything here could be my own text. Tolkien, Scifi, Heavy Metal, Programming… Great article, congratulations. A lovely article, about how the right thing came to you at the right time, it’s the perfect way for a kid to learn!! Good stuff. I share many of the things you describe here (except *I* owned the spectrum). I’m a bit older and french but the many things you discovered thanks to this game have had the same impacts on me. Hmmm I see you made “reviews” for Lords of Midnight and Kung Fu Master (had forgotten those names) : that talks to me. I’ll keep reading. Thanks for this “lovely” article as Brian wrote. You have mastered 0.0% of this adventure. Ahaha, I can’t believe this 🙂 I feel just like you, only that I was a bit older then, 13, 14 maybe, living in Almada. Oh, the sleepless nights trying to play that thing. The absolute shock and awe each time I managed to go beyond a certain level and was greeted with a totally unexpected picture on the screen. That game changed me. I began loving Tolkien and his universe, in a country hardly anyone read his books. Thank you for sharing. 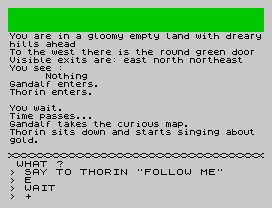 Who else saw “The Hobbit” and remembered a ZX Spectrum game of the 80’s when Thorin started to sing? Just imagine being imprisoned in the Goblins dungeon, and trying desperately to escape from it to avoid both of us ending up as dinner for the Goblin king. But I can’t do it alone, you need Thorin to help you. And what does that big oaf do after asking him for his help?? He just sits down and starts to sing about his precious gold!!! That usually was the enough-is-enough moment for me. I got soooo infuriated by then that I took the Short Strong Sword and tried to kill him.